The cost of fear alone is a major one for economies to bear. 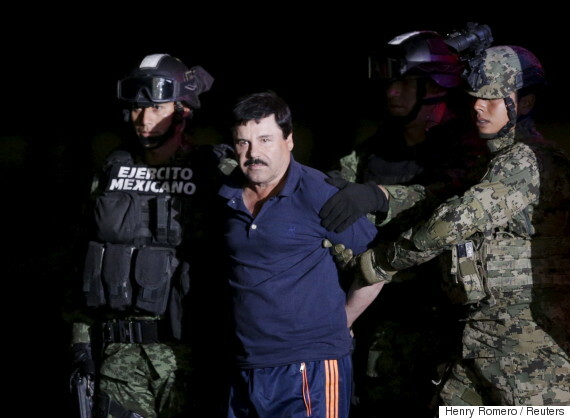 The Mexican drug war has killed as many as 160,000 people. But there's an economic cost to drug violence, too. And though it's dropped over the past five years, it's still an immense one. The "Mexico Peace Index," released by the Institute for Economics and Peace (IEP), calculates the economic impact of violence in Mexico at around C$154 billion (2.12 trillion pesos) in 2015. That figure is equivalent to 19 per cent of Mexico's Gross Domestic Product (GDP) — though it is down 38 per cent from 2011, when drug-fueled violence was at its height, and the cost of violence was calculated at C$213 billion (2.92 trillion pesos). The IEP calculated these numbers by estimating the cost of crimes such as homicide, violent crime such as assault and robbery, as well as organized crime, and violence containment by the government. It then included "direct costs" such as medical treatment; "indirect costs" such as lost productivity; and the "multiplier effect," which describes "flow-on effects" of violence on an economy. Homicide, for example, had a total economic impact of $52 billion (727.4 billion pesos) in 2015. 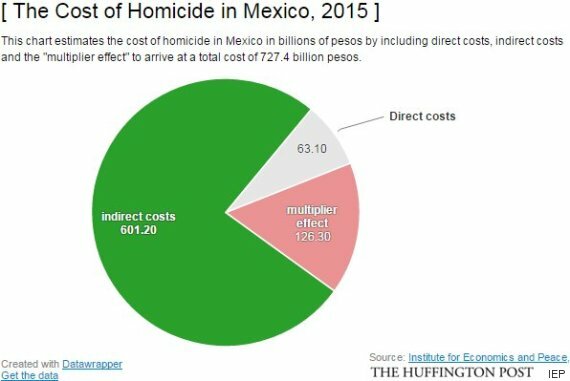 The direct costs of homicide were estimated at $4.6 billion (63.1 billion pesos), indirect costs at $43.8 billion (601.2 billion pesos) and the multiplier effect at $9.2 billion (126.3 billion pesos). The highest costs are those associated with violent crime, going from $90 billion (1.238 trillion pesos) in 2003 to $61.5 billion (845.2 billion pesos) last year. The latest violent crime figure represents a drop of about $7 billion (96 billion pesos) from the previous year, as the level of violent crime fell by 9.5 per cent in 2015. But government spending on areas such as the justice system and the military have grown in the same period, from $13 billion (182 billion pesos) in 2003 to $32 billion (440.2 billion pesos) in 2015. But even the fear of violence alone has a cost. The report pegged it at $3.6 billion (49.1 billion pesos) in 2003, growing to $3.9 billion (54.1 billion pesos) in 2015. This is money that could otherwise have been spent on business transactions, increasing people's well-being and on going out and being social, the report said. The years 2007 to 2011 proved a particularly problematic period for Mexico, with the cost of violence growing by 33 per cent as fighting flared up between the Mexican government and cartels such as Sinaloa, Los Zetas and the Beltran Leyva organization. 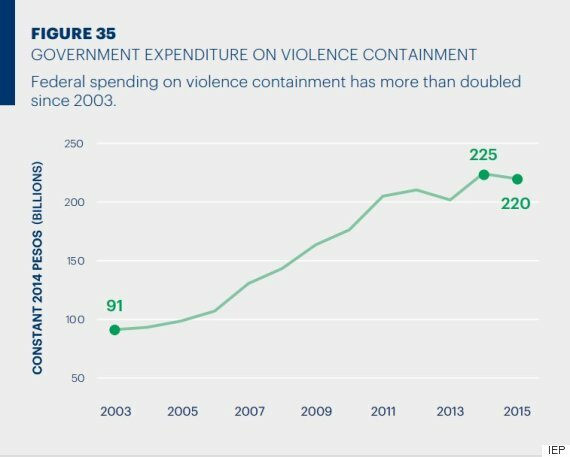 Since then the Mexican government has spent more and more money on containing violence, and the costs of violent crime and homicide have fallen in turn. Two things could happen going forward. 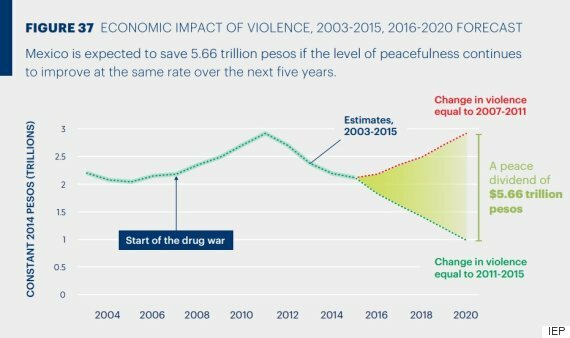 Violence could keep falling as it has since 2011, and the country could save as much as $407.7 billion (5.6 trillion pesos) up to 2020. The IEP describes this as a "peace dividend." 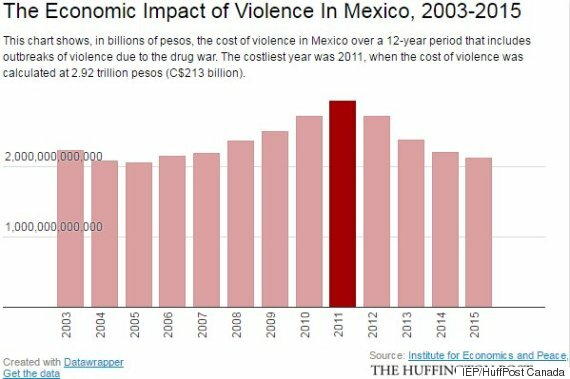 Or violence could flare up again as it did from 2007 to 2011, and the cost to Mexico's economy would be about $917 billion (12.6 trillion pesos). The statistics come as health experts call on countries to decriminalize or even legalize drugs — an approach that, in some cases, has been shown to reduce violent crime. Two years ago, researchers with the University of Texas at Dallas found that legalized medical marijuana could lessen crimes such as assault and homicide. That research was conducted by looking at 11 states that had legalized medical pot between 1990 and 2006. In 2001, Portugal decriminalized the possession of drugs such as marijuana, cocaine and MDMA, treating it as a lesser crime, like a parking ticket, Der Spiegel reported. Results have been mixed, but very few people there die from overdoses compared to the rest of Europe, according to The Independent. The Canadian government has pledged to introduce legislation to legalize marijuana in the spring of 2017.